If you have a standard chandelier with boring shades solid colors, it is easy to change color or to paint. Metal can be painted in three ways: acrylic paint, alkyd enamel, or enamel spray. Old metal chandelier can be painted. She will be beautiful and bright, will decorate the interior for many years. Get an alkyd enamel, acrylic paint or spray paint. Alkyd enamel is holding up better than other colors. It needs to be applied in several layers. Clean and degrease the metal parts of the chandelier (with sandpaper and acetone). With a brush apply the first coat of enamel. Wait until it fully dries. 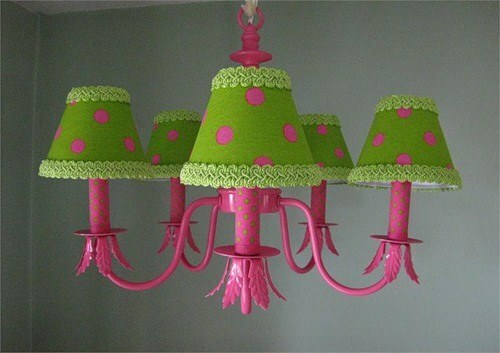 Then paint the details of the chandelier again until you get the desired color effect (saturated or subtle colors). Remember that acrylic enamel has a very unpleasant smell, so it is desirable to work in the home – better in the fresh air or at least on the balcony. Art acrylic very well placed on the metal, however, it is not resistant. If you decide to use this method of painting, keep in mind that you will need to update the color of the chandelier every two to three months. You can also cover the acrylic paint with varnish so the color will be bright over the long term. Close all around the paper or papers, if are going to paint metal chandelier with paint, spraying it from the spray. This is the fastest way to upgrade a chandelier but not very convenient, as the paint is sprayed in all directions. Prepare the surface for painting. Dust, sand smooth with sandpaper, degrease with acetone. Stir the contents of the container, shaking it – it will make the color uniform and prevent clogging of the sprayer. Conduct a test spraying, by pressing gently on the sprayer. Hold the container upright, spraying a thin layer of paint at a distance of 25 cm in order to achieve the most saturated colors, paint the surface in several layers, making the break between each drawing for two or three minutes. Color or paint the glass shades (matte, glossy, transparent) in any color you like. To do this, purchase a special paint intended for glass painting (sold in stores for artists). Paint your design or pattern that suits to the overall interior of your home. Use ready-made stencils (make your own Il buy in stores for artists), if you doubt your artistic talents. Remember that whatever method you would not have painted my chandelier, it will look better than the old. Experiment, mix colors, create new designs, and you will make your interior irresistible! For the manufacture of the original lampand their hands fit the most common items: plastic bottles and disposable tableware, thread and twine, felt and crocheted doilies, even a teapot and used coffee filters. Cut the bottom of a plastic bottle, Unscrew the cap. This will be the base for the light. Cut the handles of plastic spoons. Apply on top of your spoon a drop of super glue and glue to the bottom of the bottle. Detail press and hold for a few seconds. Next spoon stick as close as possible to the first. Glue the remaining parts in the series. Tablespoons of next row, attach offset and overlap on the previous number. Try to make a plastic bottle was not visible. Similarly glue all the spoons on the base. Insert the lamp cartridge and replace the energy saving light bulb. It is not heated, so this shade melts. 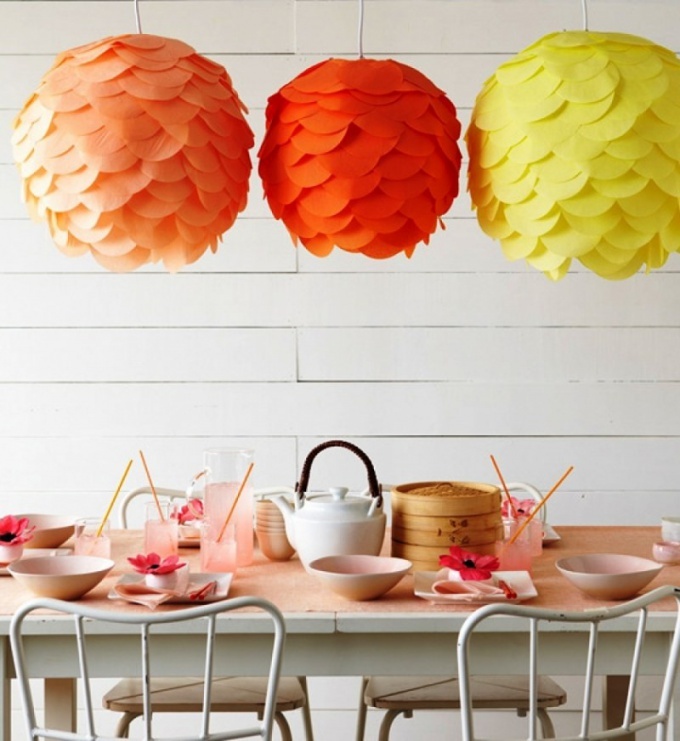 As the basis for this original chandeliers you will need a simple paper lamp sold in IKEA. Of tissue paper cut into circles of the same diameter. Glue them to the paper lamp. Attach parts of tissue paper a piece of double-sided tape and glue to the lamp, wherein the first number of do at the bottom, and affix the subsequent lap. This exquisite lamp - a real godsend for coffee lovers. 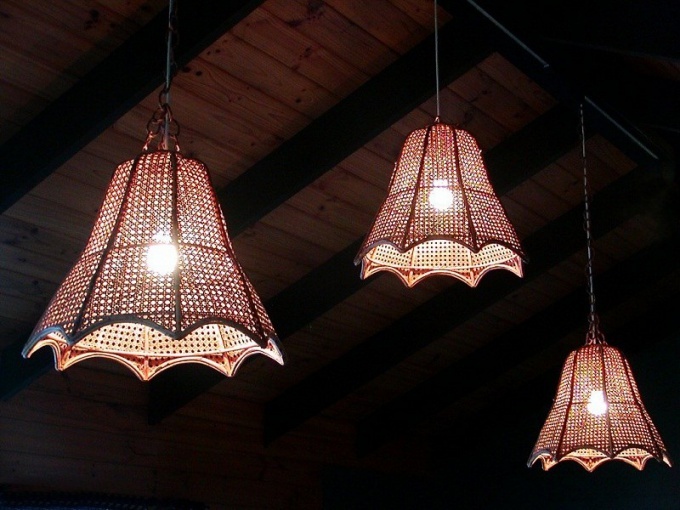 Invented his American designer Lampada, but it is possible to do with their hands. For its production will need coffee filters, which should be pre-washed and dried. 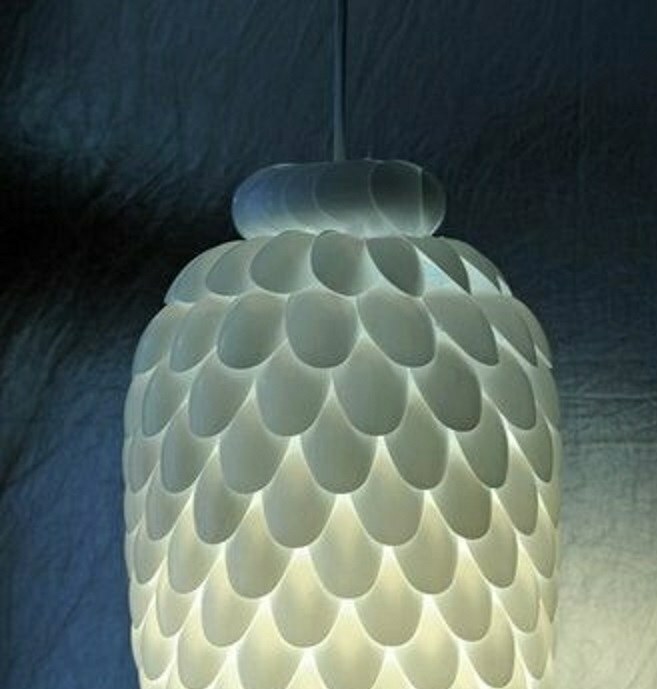 Prepared filters stick on a lampshade with PVA glue and allow the lamp to dry. Now you can insert a cartridge, screw in energy saving light bulbs and enjoy the pleasant soft light and light fragrance drink. 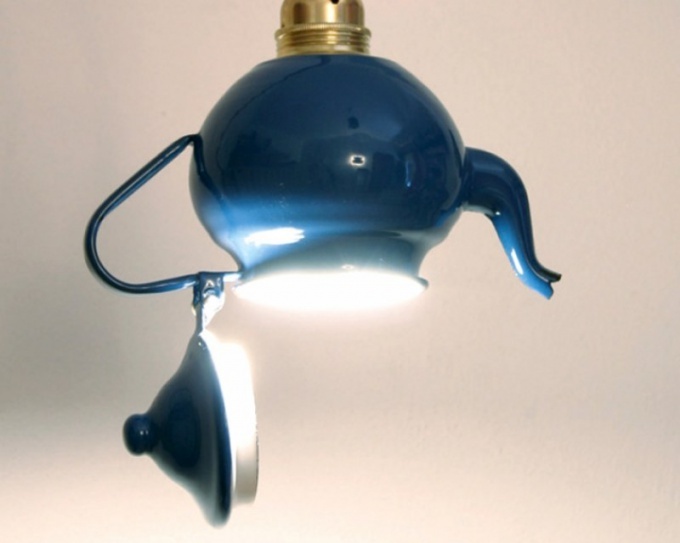 The original idea for a lamp made with your own hands, you can borrow from Italian designer Tommaso Guerra, who created a cute lamp of an ordinary kettle. Take the teapot (the easiest way to work with plastic), and make the bottom hole of the required size, to be able to insert the cartridge. To do this, use a drill with a special nozzle. If necessary, during operation, rinse it with water. Insert the cartridge and screw energy saving light bulb. Advice 4 : How to make a chandelier with his own hands? 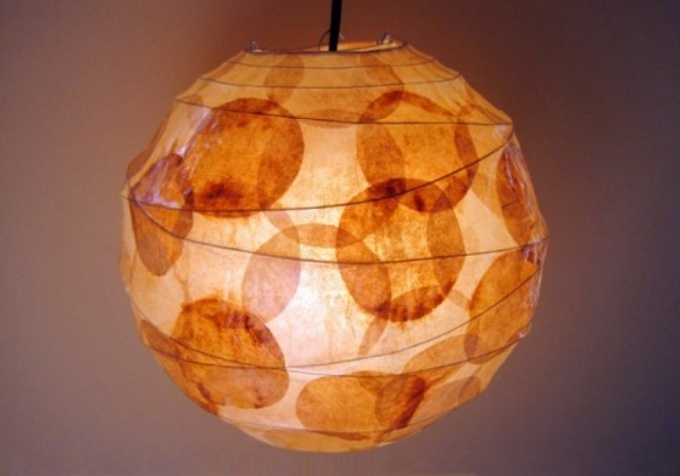 Original lamp for interior decoration can be made from accessible and simple materials. This item is made by hand, can become accent in the decor of the room, if you show creativity and accuracy. 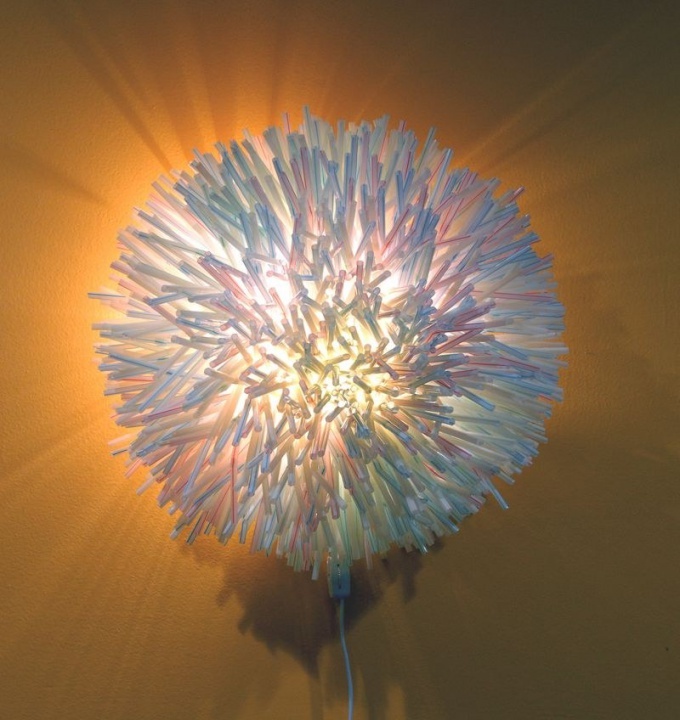 For making this lamp you will need a thick colored thread. Before you start to make a lampshade, check out the threads on the stability of the dye. Take a small piece from each roll, soak them with PVA glue and RUB the friend about the friend, then lay on a white sheet. If some paint smeared, better not use these threads for DIY. And that shade will turn out with dirty stains. Inflate most conventional balloon to the size of what you want to see the finished chandelier. Make several turns of thread the same color all over the rubber surface and RUB it with a brush with PVA glue. Then take the yarn of another color and do it the same operation. Thus the layers wrap a ball of multicolored thread. You can repeat these layers or do anything different. Wrap the balloon can be of the same color yarn, thin yarn, jute or hemp rope. You need completely dry cotton lampshade. Hang it so that it was in the air and touches nothing. This can be done by putting a flat plank between the backs of two chairs, and on it the thread tying crafts. Or lay the ladder and attach the lampshade in the center, so it does not touch the stairs. On the floor lay a rag or newspaper, glue, thread will drip. Leave a makeshift lamp to dry for a few days. Then pierce with a needle ball and remove it. The shade can be left in the form of a ball or cut it into two semicircles. In this case, the finished appearance can be given by treating the cut edge with a thin lace. For the lamp use energy-saving light bulb. To make a chandelier with pendants can be modifying ready. You need from her metal frame. If the foundations you have not, use a wooden or plastic Hoop large size or a twist wire frame. Choose a material for the manufacture of suspensions. You can put a glass or wooden beads on thin twine making thread. For an additional decoration on these threads attach the feathers, they will add a romantic chandelier. If it is the lamp in the nursery, the quality of the parts for the suspension, take small toys. You can use both soft and lightweight plastic. Unusual and will look to the lamp, if you make charms, or to wrap the frame metal chain with small links that are sold at the cut at the hardware store. In the future, the chandelier can be painted from a container. Depending on made pendants decorate the frame. It can be painted or tighten tissue. Secure on the basis of decoration and the chandelier is ready.